It’s Christmas time in the small town of Harvest in Ohio. Bailey King and her Amish grandmother are busy in their Swissmen Sweets shop. It’s a busy time of year for the candy business. It hasn’t been that long since Bailey left her job and her ex-boyfriend in New York City for the small town life. She is shocked when her ex-boyfriend shows up in Harvest. He wants to film his TV show in the shop and reunite with his former girlfriend. Bailey wants none of that, but Eric isn’t backing off. When Eric’s executive producer is murdered, all eyes turn in his direction. He begs Bailey to help prove his innocence. However, Bailey isn’t so sure he *is* innocent and neither is her new boyfriend, who happens to be the sheriff deputy investigating the homicide. As Bailey does her own investigating, she begins to realize that the victim had quite a few secrets. This leads to quite a few suspects with more reason to kill than Eric. Bailey is determined to get to the bottom of this murder mystery. This is the third book in the series. I haven’t read the first two books and I was a little worried about jumping into the middle of it. I had no reason to worry. There’s more than enough information included throughout the book so I didn’t feel lost at all. In fact, for me, it was just the opposite. I felt like I already knew Bailey. The cast of characters are well rounded and very likeable. 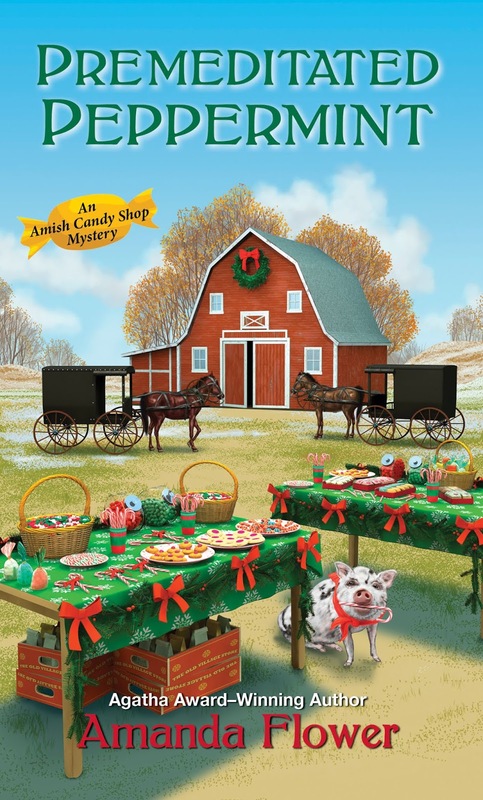 The setting is perfect for a cozy mystery. The author painted a vivid picture and I can still smell the peppermint through the pages. I like the mix of Amish and Englisch ways. 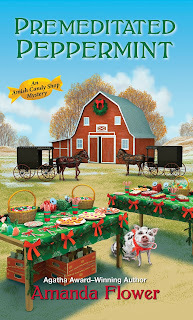 We learn a bit about the Amish customs as we read this one. It felt authentic to me and brought me right into the story from the beginning. The storyline is fast-paced. I didn’t figure out whodunnit until Bailey did towards the end. As all the facts unfolded, I realized what happened. It is a well-written mystery. This can easily become a “must read” series for me. I do need to go back and read the first two, but I will. I’m looking forward to book #4. I grew up in Ohio so that caught my attention, and I lived not far from the Amish so that interested me too. Not sure I'll read it but will keep it in mind since I like this author. Sounds like a good book to get in the holiday spirit. I have this one and am feeling not so great today. I think curling up on the couch with the book sounds perfect though I think it may make me want candy!